Last night I flipped through the channels trying to find something to watch. I feel like I am always searching for a new favorite movie. Well, I found it. 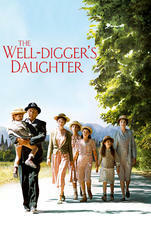 The Well-Digger’s Daughter is officially the best movie I have seen all year. It is French with subtitles. DO NOT LET THIS STOP YOU. I laughed, I sighed, I hoped, I wished, and I gave it a standing ovation! If you stream Netflix, it is there for the taking. This is a memorable film, I know you will love it.